For a nation known for its inclement weather, Great Britain sure built a lot of great cars for enjoying the sunshine. Today's Nice Price or Crack Pipe Triumph looks to be a shining example of just such a car, the question of course is whether buying it would be such a bright idea. Real Porsche 959s go for like a gazillion dollars and a night with Demi Moore. Sadly for the individual trying to unload the Texas teabag that was yesterday's dubious 930-based homage to that Group B groin grab, 73% of you felt his price tag was too large for a car so not in charge, and moreover, that even Ms. Moore probably wouldn't give it the time of day. While more British than that Monty Python shout out, wooly car builder Triumph was actually founded by a pair of German gents who emigrated to the Isles all the way back in the Nineteenth Century. Completing the circle, the moribund brand is presently owned by German automaker BMW. In between those Deutschlandmark events the company built bicycles, motorcycles, raced Le Mans, spun off the bike businesses, harked the Heralds, went Stag, and built a bunch of wonderful hair-shirted sports cars like today's 1970 TR6. The TR series is an excellent example of evolution in action. Over the course of its 23-year lifespan the TRs 2-6 developed through two basic body styles and series of mechanical and feature updates that saw the marque go from a four cylinder live axle roadster to a roarty straight six sporting convertible with IRS. The follow up TR7 was less an evolution of the previous lineage and more an aberration perhaps caused by radiation from underground nuclear testing or perhaps English food. As noted, the TR6 is the last in the line that may be traced back to the debut of the TR2 in 1953 at Earl's Court. That car was a reaction to MG's success in the North American market, and followed Triumph Motor's failed attempt to wrestle the Morgan Motor Company from Henry Frederick Stanley. The TR featured a ladder frame based on that of the Standard Eight and a stout anvil of a 2-litre from the Vanguard. After two years the 2 was replaced with the 3, although differences amounted to little more than the grille and relevance to a different School House Rock episode. The next iteration however - while maintaining the a-arm front/leaf under-sprung rear suspension and worm and peg steering - was draped in a whole new set of clothes, penned by Italian designer Giovanni Michelotti. Agressive and roomy, the new TR4 eschewed the earlier cars' nod to British stiff upper lippiness with roll up windows and a top that didn't require a troop of Boy Scouts to erect. Along the way the TR4 gained a semi trailing arm IRS adapted to the existing frame, becoming the TR4A. It also was blessed - cue singing angels - with a fuel injected (sadly denied the U.S.) 2,498-cc straight six, good for 150 horses in Merry Old. That knocked both performance and model numbering up, creating the TR5. Here in the States we received the engine but with a pair of Zenith Stromberg CD 175s in place of the Lucas FI, and about 40 fewer horses, as well as odd TR250 badging. By the time the seventies were on the event horizon, the TR bodystyle had been in the market for more than 6 years and so Triumph commissioned Germany's (there they are again. Don't mention the war!) Karmann to undertake a restyling, and the new front and rear appearance was so successful that few picked up on the fact that it was still the same car through the middle. 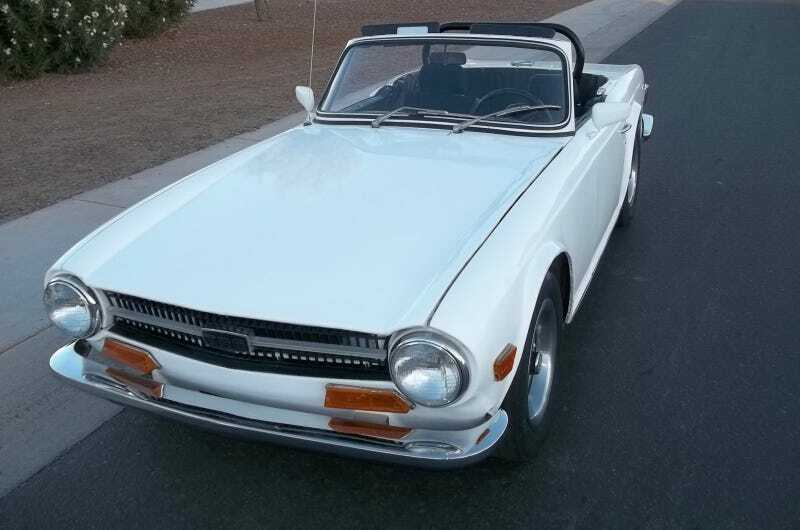 This 1970 TR6 sports that clean Karmann styling, in white with its kamm back painted an appropriately factory black. The OHV iron block and head six was supposed to put out 104-bhp in its U.S. trim, and this one is claimed to have enjoyed a recent service. Backing that up is Triumph's four speed manual, a gearbox not known for being particularly robust, its sychros seemingly made from plasticine porters. At least that's been my experience - shakes fist at Triumph-shaped cloud. Underneath the clean and apparently flaw-free body is a frame that's willowy enough to star in circ de soleil, a feature of the TR range that you either hate, or accept as an engaging part of its personality. The obvious major issues apparent by this car's ad are: a lack of a hood (although the seller says the bows are intact), a pair of what look like Scheel buckets, electric windows(! ), a goofball speedo, and the seller's inability to locate the caps lock key. Dude, we get it, you're loud. On the plus side it's a TR6 that's in pretty good shape, and - wooden dash! It also comes with a price that doesn't seem to be designed to engender nosebleeds and fainting spells - $4,600. Sure, for that kind of money you could get a good Miata, but that and the TR6 are two very different driving experiences. The Triumph should be the torque of the town in a way the Mazda just can't manage. The question is, should this particular TR6 command that kind of cheddar? Would you advocate someone paying $4,600 for this white knight? Or, is that too much to ask to TR-away? Pheonix Craigslist or go here if the ad disappears.